Millions of people from everywhere in the world happen to love the game of Bingo. It is played in many different forms. In the sixteenth century, the game Bingo was played in Italy, but there it was called Lotto, or Lo Giuoco del Lotto D'Italia. It is still played in Italy today. 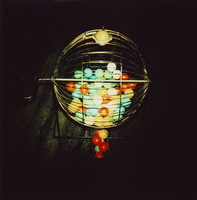 Around the eighteenth century, Bingo made its appearance in the French courts. The United States first saw Bingo in about the early twentieth century or so. Bingo was at first called beano. This is what was first called out when someone completed a certain number pattern. This game was played by a caller yelling out numbers between one and ninety to players who had cards with numbers on them. The difference in this game was that there was a predetermined sequence of numbers that a person had to try and match, and whoever did this first won the game. The game Bingo was then modified by Edwin Lowe, an American citizen, and a math professor named Carl Leffler. Leffler is said to have made over 6,000 different Bingo cards. Together, they made the game into what it is today, and decided to sell it as a more family-oriented game. Bingo soon caught on all over, and people from young and old began to play it. By the year 1934, an estimated 10,000 Bingo games were played within a week. Churches and organizations started playing Bingo to help raise money for different activities. It became a popular game among all classes of people. The history of Bingo also began with educational forms of it being played with children. Many European countries use Bingo to help teach their kids and school children math and counting. Bingo is also used in the United States as a teaching and spelling tool, and it is a fun game for kids to play while they learn. Today, Bingo players spend an average of $90 million dollars a week on Bingo in the United States alone. The modern game of Bingo is now played using cards that have the numbers one through seventy-five printed on them. The middle square is blank, and the card is made up of five rows and columns. Someone is in charge of calling out numbers, usually picked from a rolling ball. Each number is called out, and those who have that number use their dauber, or a chip, to mark off the number. When one row is completed, in a straight line or diagonal, then the person calls Bingo. The first one to call Bingo wins. Sometimes, two or more players can have Bingo at once; if this happens, the prize money is usually split equally. Bingo is now played all over the country, from schools to churches to bingo halls. It is an extremely popular game, among both the young and the old. Many churches and organizations use the game of Bingo to hold fundraisers to raise money for various events. 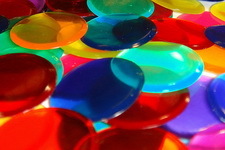 Bingo can also be found in the casinos, played for much bigger cash prizes. Since the invention of the Internet, online Bingo has also taken off. Players can play many cards at a time, thus increasing their chances of winning. 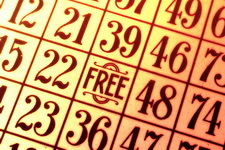 Online Bingo can be just as fun because the player can deposit money into their "account" and win real money, as well. The rules for online Bingo are basically the same as offline Bingo, which makes for an easy and enjoyable game. Bingo is a game that started years ago and has roots in the history of many countries, and continues to be a widespread and popular game today.